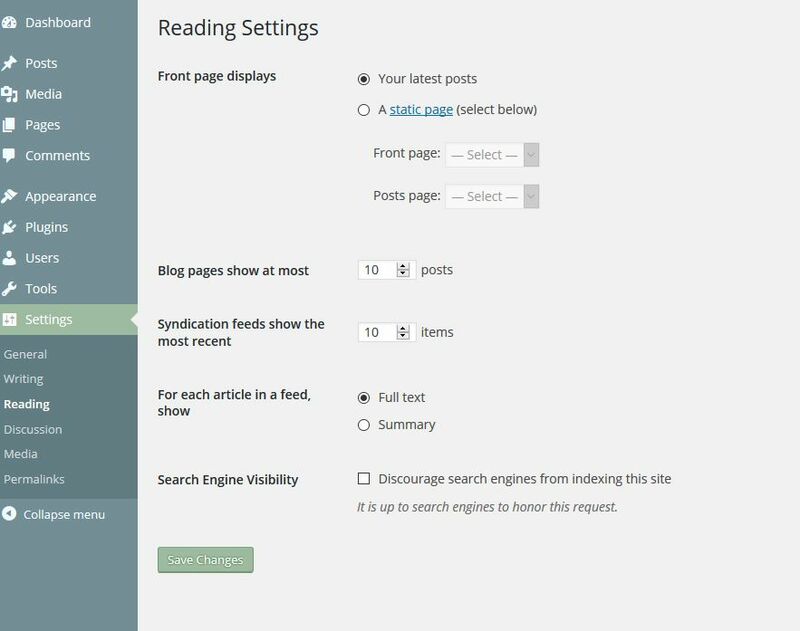 The Settings/Reading page in the WordPress dashboard determines what your website visitors see when they visit your website – the type of page that you use as the front page of your website. The first section lets you specify if your ‘home’ page will be a page displaying a set number of the posts that you have published or a static page. If you select Your Latest Posts and then save the setting you will be able to visit the front page of your website and see the posts that you have published. How many of those posts that are displayed is set in the next section – Blog Pages Show At Most – with a numerical dropdown selector. The number of posts that you want to display is purely personal preference. However, consider the average length of the articles that you publish. The longer your articles the longer your home page will become. If you average 300-word articles and leave this setting at the default of 10 posts your home page will display 3000 words plus the space for titles, author info and possibly featured images. If you decide to use one of your static pages as the front page of your website, chose that setting in the first section of the Settings page and then select which page you want to use by selecting that page from the dropdown list next to Front Page. That page will now be your home page and you can use it to display the ‘evergreen’ (not date-sensitive) content describing your business or website. If you have a static front page where are your published posts displayed? Unless you choose some additional settings your posts will not be displayed on your website. This may be what you want to do if you are just looking for a static site like non-cms websites are set up – just a series of static pages. If you want your published posts to be displayed on your site you will have to choose another page in that first section of the settings next to Posts Page. Usually this will mean publishing a new (blank) page called Blog or News or something similar and then selecting it from the dropdown menu. The published page should have no content in it – that content will not appear on the website – the page is just a placeholder that WordPress will use to display your posts. You can include it in your navigation menu as a way to access your articles. Be sure not to set your Posts Page to a page you have already published which contains content for your site. 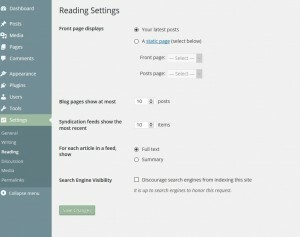 Another way to allow access to your posts without selecting a Posts Page in the Readings settings is to have a sidebar area on your site that contains some of the standard widgets that come with the basic WordPress installation – such as the Post Categories listing or the Recently Published Posts listing. Clicking on one of the title listings in the widget gives the reader access to the single-post page or the post category archive page. The third and fourth sections on the Readings Settings page refer to Feeds. If you remember from the discussion of the Settings/Writing page options there was one at the bottom of the page called Update services. These update services receive information when you publish an article on your website. They receive a ‘Feed.’ The settings on this page specify whether they are to get the whole article or the summary/excerpt and how many articles in your published list they are to receive. Some directory/feed services to which you may link your website will show the whole article unless you specify summary. If the whole article is published the reader has no reason to visit our website. If the feed just publishes the summary/excerpt and the subscriber/reader is interested they will have to click through to your website to read the remainder of your article. This last setting on the page, if checked, will add a tag to the header of every page on your site telling search engines to not index the page. 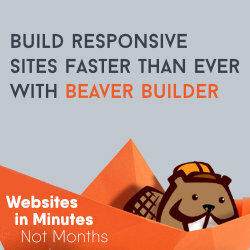 If you want your website to be operational and to appear in Google/Bing/etc. search results, then you really don’t want this box checked. Some SEO plugins (Yoast SEO) will give you very obvious warnings if you forget and leave the box checked. As the note below the checkbox says, whether or not the search engine adheres to your desire to not index the site is up to them. Even if you check the box do not be surprised to see pages/posts from your website in the search engine search results. When would you want to discourage search engines? This is usually done when the website is under construction and you don’t want the search engines to index your ‘in progress’ website with partial content and an incomplete design. It is best to never design/redesign a ‘live’ website. A better practice would be to add a ‘maintenance mode’ plugin (such as WP Maintenance Mode) and set it to display a splash page with ‘Coming Soon’ message. 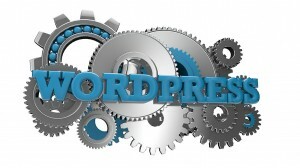 You will still be able to log into the WordPress dashboard, work on and view the actual website but search engines and website visitors without administrative access will only see the maintenance mode splash page.